THE SHAME OF THE EUROPEAN UNION. 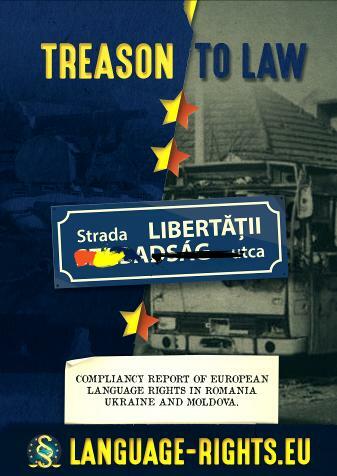 The Foundation European Language Rights launched its “THE SHAME OF THE EUROPEAN UNION” campaign. The purpose of this campaign is to inform the public about the fact that the presidency of the council of the European Union is not complying with those treaties, which it signed to become EU and NATO member. Since autochthonous European Citizens are still second rang citizens in Romania. Ethnic Hungarians, Jews and Germans are almost entirely excluded from public administration and law enforcement. Their constitutional language rights are not respected. Before entering the European Union Romania was a North-Korean style dictatorship, where its population was living in fear and living well below the average European living standards. The secret police the “SECURITATE” controlled everyone. Despite more than 10 years of EU membership Romania failed to transform itself to a rule of law state. 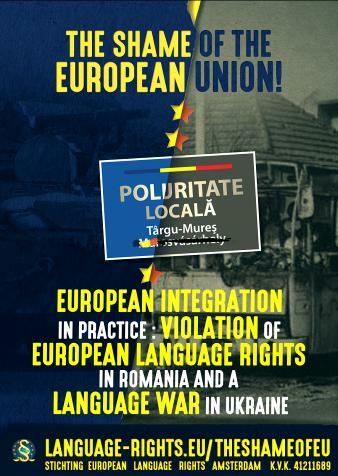 In our report TREASON TO LAW we reported about the case of the Politia Locala in Marosvásárhely/Tirgu-Mures. This vivid illustration of lawlessness had been the cornerstone of our campaign in the Referendum against the association agreement with the Ukraine. During our campaign we stressed the importance of language rights and general human rights for geopolitical language minorities. The association agreement between the European Union and Ukraine had been ratified against the will of the Dutch Population. A couple of days after this undemocratic act Ukraine rejected core European Values by banning the free use of the Russian, Hungarian and Romanian regional languages. It is truly THE SHAME OF THE EUROPEAN UNION, that it is not able to defend European core values such as linguistic Human Rights, Rule of Law, fights against corruption as well as democracy within its own member states and those states that want to be EU members. The Foundation European Language Rights campaigned during the Dutch Referendum on the Association agreement between the European Union and the Ukraine for a NO vote. Over 62 % of the Dutch Population voted with NO.